Besides the alluring, fragrant smell, my excitement over a recent arrival of a Christmas table centerpiece lured Mom into the kitchen to take a peak. Being so petite (less than 5-feet tall), she needed to grab a stepping stool to raise her up to better see this creative wreath from Maui, Hawaii. I fell in love with Protea (Protea cynaroides) at first sight this year. A fellow church member took some in to our Flower Guild for a special farewell dinner arrangement we were making for our retiring Rector and his wife. 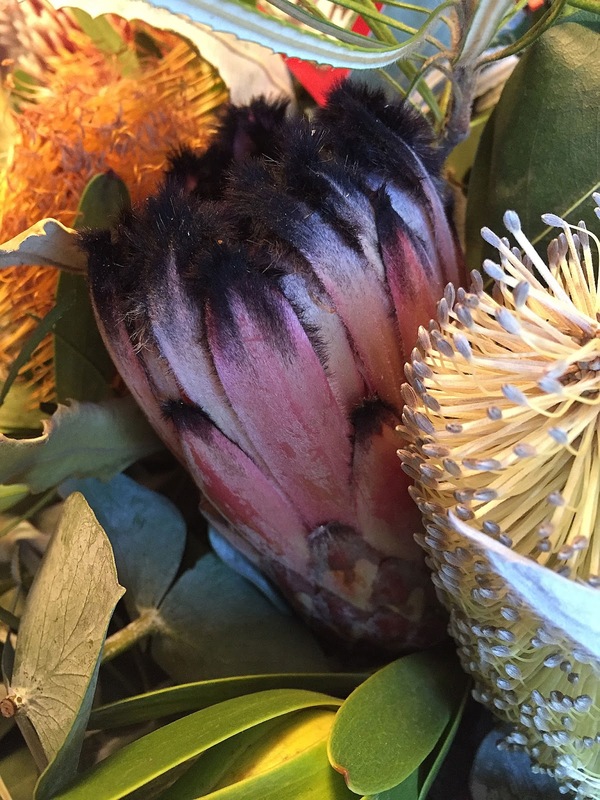 One of our very special friends remembered that I loooooved it and sent us a Protea wreath for the holidays. The blooms look quite unusual and will make an exquisite holiday centerpiece. The Maui florist grows 25 different varieties. Some must be fragrant, because the wreath has a very pleasant aroma. I'm learning the names of some of the varieties. King Protea's look large and urchin-like (shown above). Ours measures 6-inches. Pink Mink (shown) is another unusual Protea bloom. Pink Mink feels soft and has feathery black tips; we've never seen anything like it. Proteas grow native in South Africa and must grow pretty well in Hawaii too, which is where ours were grown. Our beautiful wreath was handmade by AnuheaFlowers.com - the second largest Protea farm in Maui. The arrangement included flower buds, eucalyptus and textured greens picked from their farm in Olinda on the slopes of Haleakala. Blog post and photos Copyright (C)Wind. All rights reserved. Thank you Audrey, Helen and Rachel!